National Paper Airplane Day falls on May 26th. It is believed that after the invention of paper in 500 BCE, paper airplanes started showing up around the world. Even Leonardo Da Vinci used parchment paper to design his models for manned aircraft. Orville and Wilbur Wright were known to study paper aircraft extensively before they made their first historic flight on December 17th, 1903. National Paper Airplane Day is a day to recognize the accomplishments of our first aviators but even more so, it is a day to create the best paper airplane possible and send it skyward. Have you ever flown in an airplane? Where? When? What did you like/dislike about flying in a plane? Have you ever made a paper airplane? Did it fly? Explain that today is National Paper Airplane Day and that they are going to make a paper airplane and then see if it will fly. Watch the following YouTube video here. Give every student a piece of paper and then watch the video again, pausing at every step to make sure they are following the directions correctly. When the airplanes have been constructed, ask students to name their airplane and then have them introduce their plane and show how far it will fly. Did you notice that even though we all made the same plane, some flew farther than others? Why do you think this happened? Do you think that you could make your plane fly farther if you had another chance? Why do you think this? Raise your hand if your second flight went farther than your first. If it went farther, what did you do differently? Explain that flying a plane is all about how the air moves around the bottom and the top of the plane. If you practise long enough and hold your paper plane in different positions to launch it you might see different results. 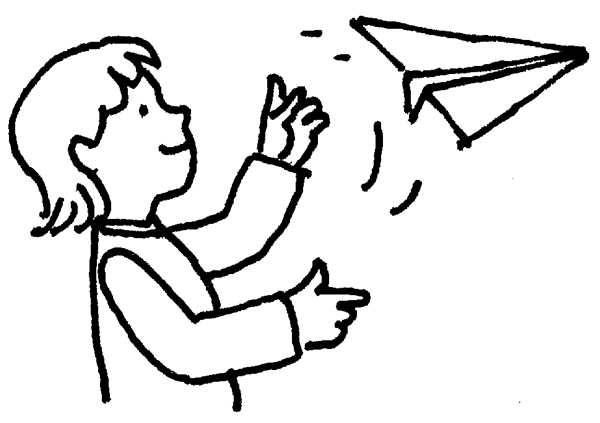 Challenge students to make other paper airplanes at home and bring them in to show the class. What do you already know about what makes a paper airplane, and an actual airplane, fly? Explain that today is National Paper Airplane Day and they are going to make paper airplanes. Watch the video here and ask students to remember the elements involved in flight. What did you learn about how planes fly? Explain that they are going to work alone or in pairs to make a paper airplane and then try to market it to a toy company. They may decorate your plane as they wish. They can practise and make adjustments until the time allotted has ended. Once the planes are ready, have them presented to the group. The rest of the class will represent the toy company that is looking for a new paper airplane. They are encouraged to ask questions after the demonstration by the developers. If you were a real toy company, which model would you pick and why? What do you think kids would be looking for in a paper airplane? What are the two forces that make planes fly? Do you think these forces played a role in these presentations? Explain. Close by challenging students to think about what they have learned about flight and to create additional models at home that fly farther and higher. Invite them to bring them to class if they wish. Explain that today is National Airplane Day. Do you think that certain paper airplane models will fly farther than others? Explain. Challenge students to play the role of an aeronautical engineer and create a paper airplane that will fly farther than any other in the class. You may work with a partner or alone. In addition to the paper that will comprise the plane itself, you may use any material you can find in the classroom to add to the look and function of your plane. Please name your plane so that it can be identified during the challenge. You may consult online sources for ideas and information. Please remember to make a list of your sources. You will be asked to introduce your model paper airplane to the class, explaining how and why it will fly the farthest. Each presenter will be given 2 opportunities to fly their plane in the class challenge. Only the farthest of the flights will be measured and recoded. Once the planes have been constructed, the aeronautical engineer(s) present their plane to the class and perform 2 challenge flights. The longest flight is measured and recorded, along with the name of the entry. What did you learn in this activity? 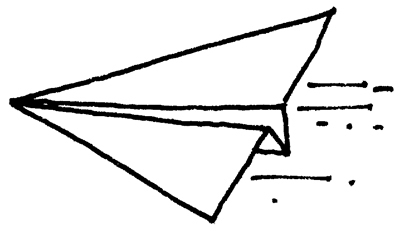 If you had another chance to design a paper airplane now that you have seen the others, what would you do differently? Did these two elements play a role when you designed your plane? Explain. Close by inviting students to continue with their interest in this area by setting up a Paper Airplane Club!